Ephrata Martial Arts has been a game changer for me. I came into the school knowing little grappling, and a little bit of striking. The school completely flipped my grappling and even toned up my striking. I've won 2 NAGAS with EMA and I also won 2 muay thai fights with them as well!! Great environment for both children and adults. Coach Justin Press is an excellent teacher and is very patient. Highly recommended! Coach Justin is a wizard on the mats! Whether he's teaching from his striking, grappling, or takedown arsenal, the man is sure to learn me, in one fashion or another. I have worked with Coach Justin for quite a few years now, and my game, as well as the games of many others, are certainly the better for it. My daughter and I have trained here for 7+ years and have enjoyed every moment of it. Coach Justin is extremely skilled in a variety of striking and grappling arts utilizing the Sambo Jiu Jitsu fusion from Vladislav Koulikov. At this school you learn through drilling and sparring with an attentive teacher who will guide you through the learning process whether you are looking to improve your health or enter the cage to fight. Personally I have lost 40lbs from when I first started training, and my daughter has progressed through the belt ranking system gaining confidence and strength along the way. Give it a try, you are stronger than you know! A great place to gain mma knowledge for all ages and skill levels. ​Such a fun environment and a non-judgment zone. Coach Justin is very patient and knowledgeable. Highly recommended to people of all ages! We are very pleased with not only the quality of instruction and training, but the discipline, teamwork, respect, and confidence that go along with it. 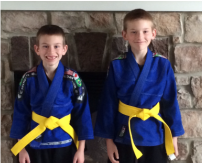 Ephrata Martial Arts has been a great place for all three of our kids. 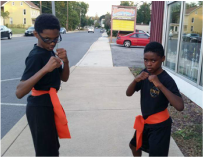 They all started taking classes at very young ages and have not only continued to enjoy learning and growing as martial artists, but have developed discipline, learned what it is to work hard for an achievement, and learned how to compete with integrity. From balance and cooridnation drills as 3 year olds to learning advanced skills in kickboxing and grappling as older kids, EMA has been a great home for martial arts education! Our daughter has a lot fun learning new things every week in the Little Warrior class. It is great to see her work for a goal and be helped to achieve it. Coach Press and Coach Angelina are amazing with the children! Highly recommend them! Ephrata Martial Arts has been teaching my daughter for the past six years. Amanda was not very confident in the beginning, but Coach Press has instilled in her a tremendous amount of self-confidence and, most importantly, traits of strong character. My daughter has become very proficient in both striking and grappling, earning many belts and sashes while making new friends. For me, I have enjoyed training in the adult classes, first coming in at 245 lbs and now, with the Coach's direction, a much more technically developed striker and grappler at 217 lbs. Coach Press fosters an amazing learning environment where the students work under his wide base of skills to develop each others mixed martial arts abilities. The program at Ephrata Martial Arts is fantastic! Prior to enrolling here my sons went to a different studio, but wanted to try something new. What struck me immediately at Ephrata Martial Arts was how there is no time wasted in class and how fast the students move when sparring. My sons are enrolled in both the Striking and Grappling classes, and both are intense and detail oriented. Sashes and belts are awarded based on how well skills are demonstrated and applied and not just from putting in time. The adult classes are equally intense and thorough. Coach Press has extensive knowledge and background in not only striking and grappling but also how the two are applied together. There is a great environment for learning at Ephrata Martial Arts. There are no egos in the adult or the children classes. Everyone supports each other and shares what they have learned to those just starting out. I highly recommend Ephrata Martial Arts to anyone who is interested in beginning or continuing a journey in martial arts. 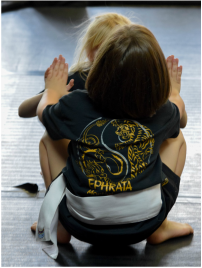 Ephrata Martial Arts is a great place for kids to learn coordination, self control, and self confidence in a fun and safe environment. Our sons are developing their skills in MMA while learning how to show respect for others and how to be a good partner. Coach Press is great with children, keeping them engaged, encouraged, and entertained while maintaining disciplined and organized classes. EMA also offers frequent social opportunities, such as sleep-overs and summer camps, that allow the students to get to know each other outside of the class setting. 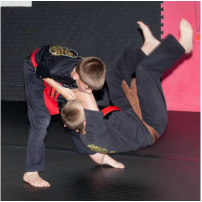 Whether a child is interested in learning MMA techniques or self defense, we fully recommend Ephrata Martial Arts. Best instructor!!! Great attitude enforced with good sportsmanship! My son loves going, he always wants to be here, and has a passion to learn. Coach Justin is great at teaching! Great place!!! Highly recommend!!! This martial arts school, Coach Justin, and all the students including adults and children have really caused a positive influence on my son. I would recommend this place and the instructor to anyone, and I already have!